A key challenge for visual practitioners is communicating the return on investement from on-going education. This is especially true for visual practioners embedded in corporate work environments. They tend to think, "Well, you already know how to draw. What else could you possibly learn?" 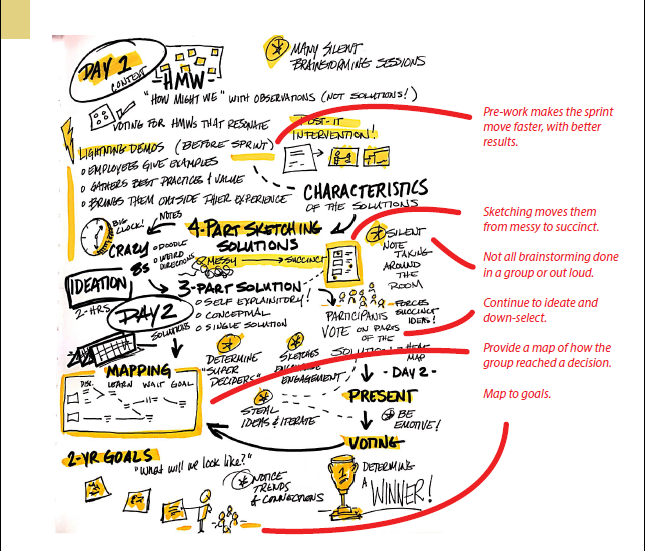 Leadership loves the novelty of graphic recordings, but continuing education (i.e. attending IFVP Annual Conferences) can be a difficult sell. Following my visit to IFVP / EuViz 2018, I created a report that would provide the maximum ROI for my leadership. Combining my graphic recordings from the conference with a formal report provided a familiar format that's seen as more "legitimate" in the corporate world. I also provided language and suggestions that bridged my learnings with ways for my company to benefit. The report was submitted within one week following my return from the conference to ensure that details weren't lost. Design Sprints have become a fundamental offering for my organization, and with the help of my report, we are incorporating ways to bring visual techniques into the process. For a customer like the United States Air Force, this is a leap forward into innovative practices. I believe this is how visual practitioners can begin to move from "recorders" to influencers. As we begin bridging the value of graphic recording directly to an organization's benefit, we become a secret weapon that will be sought after by leaders in ALL types of fields. Unmark this Blog as "Featured"